Bookassist's Paul Ferry shows how you can make use of Facebook's location and language features to target more relevant posts to parts of your fanbase. 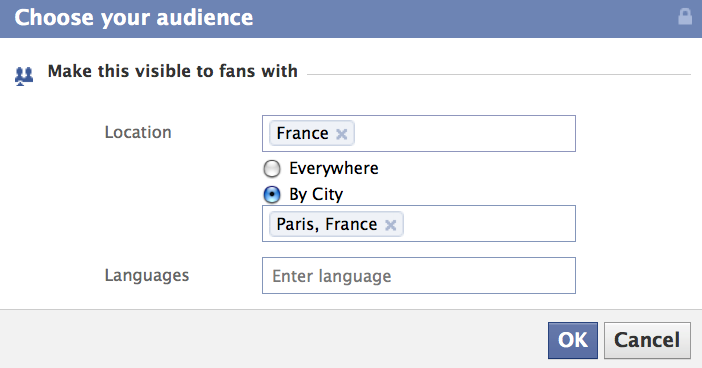 Facebook provides a useful feature in the Status box on your Facebook wall that allows you to target your fans with by location and/or language. Hotels may not be aware that they can use this to their advantage with their posts. The targeting feature is extremely useful to hotels on the continent that would like to separately target their native language speaking fans and their English speaking fans from the one hotel Facebook Fan page. It can also be useful for hotels to directly target certain countries or cities where their Facebook Fans are located. Before we look at how to use Status box feature to target your hotel's varied Facebook Fan base, we will analyse the hotel's Facebook Insights to determine the demographics of the hotel’s Facebook Fans. To analyse your hotel's Facebook Insights simply visit facebook.com/insights or click the "View Insights" link on the right hand column of your hotel's fan page when logged in. Once you have accessed the Insights section for your page, click the "Users" link in the left hand column of the page. Figure 1. 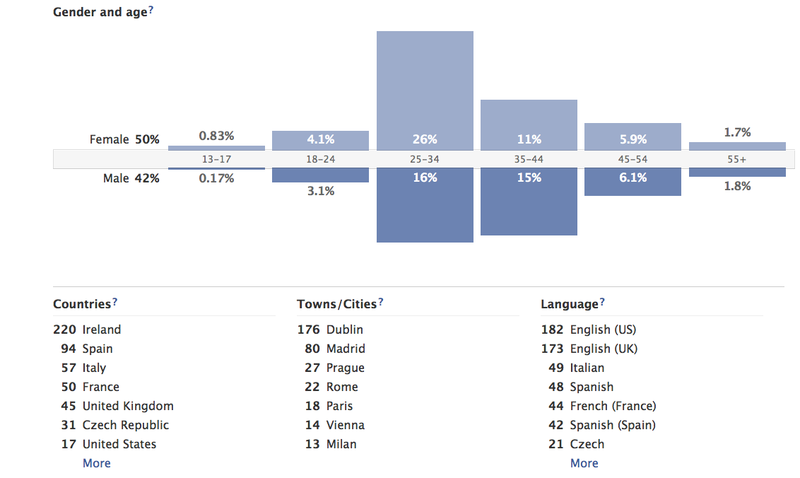 Facebook Insights, Demographics graphs found in the User section. From this data we can determine the demographics of your hotel's fan base. In this case, a quick look shows that the majority of fans are located in Ireland but there is a substantial amount of fans located in other European countries. English is the predominant language with an even split of Italian, Spanish and French speaking fans. Considering this information, posting in English will cover the majority of the fan base in most countries but posting in other languages to reach out to everyone would be highly recommended. Another additional observation is the town/cities column. Using this information your hotel can target specialised posts to smaller demographics. With Facebook Insights you have a better idea of who you should target with your posts. To activate the post targeting feature simply begin to type in the Status box and a drop-down button appears beside the "Share" button. By default this drop-down is set to "Everyone". Simply click on the drop-down and select "Customise". Choose "Customise" and a pop-up window appears. In the “Location” field of the pop-up begin to type the country or countries you would like to target your hotel’s post. Facebook will automatically generate a list of countries to select from. To further target your post to a cities or towns in a particular country, select the country first and then select the radio button "By City". Similar to the country selection field, Facebook automatically generates a list of cities or towns in your selected country so you can enter multiple cities. 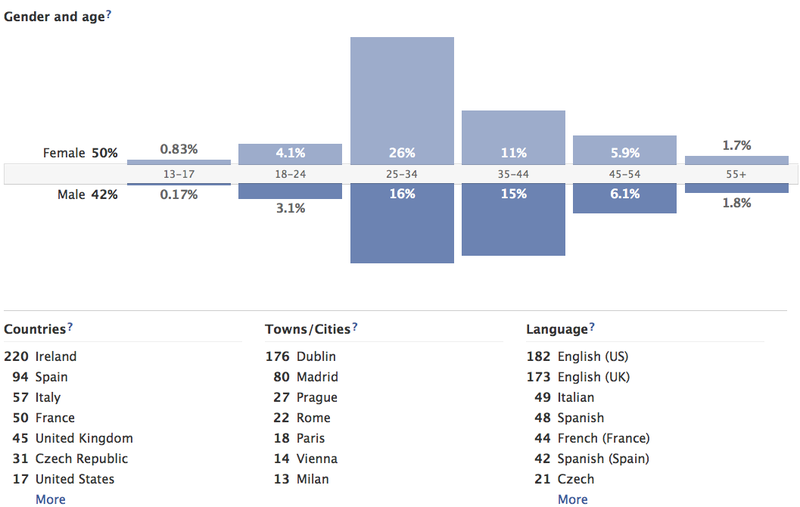 Targeting posts by languages requires the same steps as targeting by location. Select the "Customise" option from the drop-down beside the "Share" button and the pop-up will appear. In the “Languages” field simply begin to type the language or languages you would like to target. Follow the steps mentioned in the previous points to combine choices for location and for language. Different nationalities have different travel habits, and take holidays at different times of the year for example. They also have different interests in terms of what your hotel or location offers. The above steps can help hotels to more strongly target certain demographic groups with special offers or more relevant information rather than always using a “catch all” approach. This can increase interaction with your posts, and hence conversion.